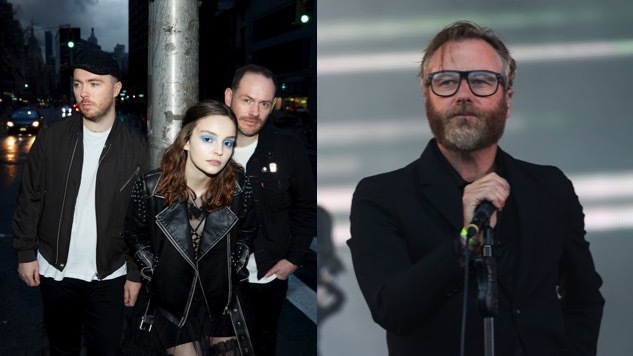 CHVRCHES have shared the second single from their forthcoming Love Is Dead (May 25, Glassnote Records), “My Enemy,” featuring The National frontman Matt Berninger. The song debuted as today’s World Record on Beats 1 on Apple Music. “My Enemy” is another indication that CHVRCHES are aiming high on their new album, packing more punch than ever in their soaring synth-pop anthems. “And you could be my enemy / and you could be my judge / if you could start remembering all the time that you used up,” sing Lauren Mayberry and Berninger in unison on the chorus, their vocals melding over echoing, ethereal synths and a steady, mid-tempo beat. “We’re all huge fans of The National and have been for a long time,” said Mayberry over the phone on Beats 1. “They’re such a classy, classic band to me and [Berninger’s] lyrics are amazing. He’s such a storyteller.” She went on to recall meeting The National (through music festivals) and describe how the collaboration with Berninger came together: “I had to email him being like ‘honestly no pressure.’ He replied in like half an hour as like, ‘yeah, I like it … send me the stems and I’ll do it tomorrow.’ It was the most efficient rock and roll transaction.” Mayberry noted that CHVRCHES multi-instrumentalist (and occasional vocalist) Martin Doherty was originally meant to sing Berninger’s part. The singer also spoke to CHVRCHES’ experience working with producers for the first time, saying, “We kind of speed dated with a bunch of producers because we’ve never worked with a producer before. That was all part of the journey of figuring out where we wanted to get to.” Grammy winner Greg Kurstin (Adele, Sia) produced eight songs on Love Is Dead, including lead single “Get Out,” but “My Enemy” was “100 percent CHVRCHES,” Mayberry says. Listen to “My Enemy” below (or via your streaming service of choice here), plus CHVRCHES’ 2013 Daytrotter Session, and revisit “Get Out” right here. You can preorder Love Is Dead here.